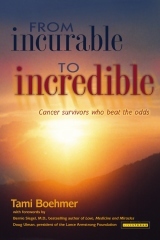 Almost two years to the day after getting inspiration to write a book about cancer survivors who overcame grim prognoses, my wife Tami Boehmer this week launched From Incurable to Incredible: Cancer Survivors Who Beat the Odds. The book is available through Create Space, an Amazon company. By the end of June, you can buy it on Amazon. We’re making arrangements to get the text in book stores. And we’ll have a supply for a July 31 book launch party in Cincinnati and other events within a couple of weeks. Tami wrote From Incurable to Incredible in part to help herself. She suffered a recurrence of her breast cancer in February 2008. The cancer had spread to lymph nodes and her liver. After hearing less-than-encouraging news from the medical community, she sought out “miracle” survivors — positive people who were doing well with their Stage IV cancer. The book shares 27 stories of a diverse group of people from throughout the country. It includes forwards by best-selling author Bernie Siegel and Doug Ulman, CEO of Livestrong Foundation. A portion of the proceeds from the book will go to Livestrong. Many of the people in this book were located through social media. For example, we connected with Doug through Twitter. Tami maintains an excellent blog, www.miraclesurvivors.com. I’ll share a case study later. Meanwhile, I encourage you to order this book. Share it with someone affected by cancer or another chronic health condition. Read it yourself. I promise you’ll get something out of it. I’ll have to admit it: I’ve never ordered anything from Zappos, the online shoe business that achieved $1 billion in sales in less than a decade. (Yet.) But I kept hearing about Zappos while following Lance Armstrong and the president of his Livestrong Foundation, Doug Ulman, in social media. Ulman’s story appears as the forward to my wife Tami Boehmer’s From Incurable to Incredible: Cancer Survivors Who Beat the Odds, due out this week. See www.miraclesurvivors.com. Doug recently appeared on a livestream hosted by Zappos employees. A promo for the stream led me to a website describing the coming launch of Delivering Happiness: A Path to Profits, Passion, and Purpose by Tony Hsieh, CEO, Zappos. There was an offer for bloggers to review an advance copy of the book, so I put in a request. Luckily, I got a free copy — with instructions to give my honest opinion. I couldn’t put Delivering Happiness down. I devoured the 258 pages in two days. Hsieh, 36, took me on a compelling journey from his adolescence to Amazon’s 2009 purchase of Zappos for $1.2 billion. By the way, the words were his — not those of a ghost writer. The story about his $40,000 job at Oracle right out of college — work that consisted of showing up at 10, setting up an automated test, e-mailing friends, going to lunch, then checking test results — shattered my image of the software giant. I have to give Hsieh credit for not staying in the boring job, or a website design business he and a buddy started. He went on to co-found a software company called LinkedExchange that sold to Microsoft in 1999 for $250 million!!! He was only 24. Easily bored, Hsieh was back in the business world with Zappos, a startup just before the dot.com bust. The ensuing story about the financial twists and turns of Zappos kept me glued to the text. I couldn’t wait to see what adventure awaited on the next page. 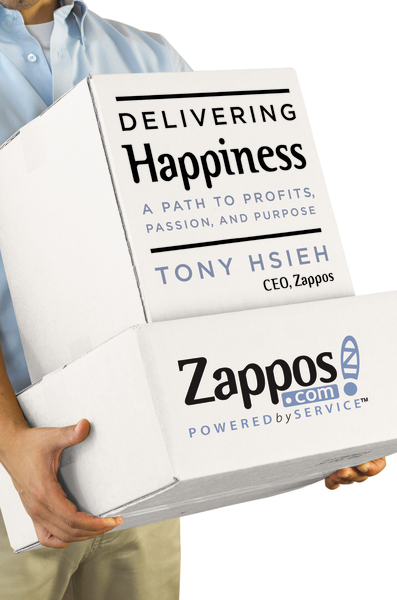 The description of Zappos culture and customer-service focus kept me eagerly reading, although it seemed anti-climactic after Hsieh’s portrait of the early days. I’m glad he shared some of his research about what makes people happy to conclude the book. It made me excited enough to pass on my copy to my boss this morning and another that I was supposed to offer as a give-away to a close friend starting a business. I highly recommend that you read this book. It offers hope in a time of so much negativity about the economy. It shows how a smart, hard-working individual can use his (or her) creativity to build a business that goes beyond making money. 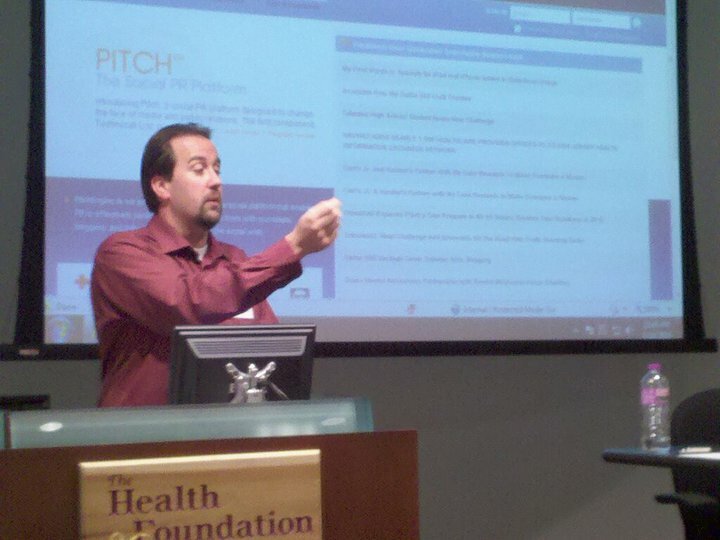 It provides a vision of how an accessible, transparent businesses in this era of social media will succeed.